The 4n1 Twin Racing Combo Bounce House Rental is a Blast! As you enter the Bounce House it has a inflatable ramp to bring comfort and safety to your children and guest. Once inside the Bounce House, the Bounce area is large and allows plenty of room to bounce, and jump. Included in this bounce house rental is a basketball hoop to add some fun to the experience as well as some friendly competition. The combo bounce house has two climbing areas, once at the top the participant will encounter our large dual lane Water slide or if rented dry an Inflatable slide dry. The slide has a mesh shade cover that also provides safety, this shade cover is see through to view the sliders as they race to the bottom. This combo bounce house rental also includes a solid shade cover that covers the entire bounce area to keep your guests cool in those hot summer months and provide protection from rain. All four sides of this bounce house have rainbow colored netting to provide ventilation and also easy viewing for those supervising the bounce house participants. Parents can watch from any side as their children bounce and slide in this bounce house. This Combo Bounce House can be rented wet or dry. When rented wet we attach an interchangable pool OR if rented dry we have our professional installers change out the pool for a bumper that provides safety and a soft landing. This Bounce House is large enough for older children and safe enough for the adventerous smaller 3 and 4 year olds. The set up area for this Combo bounce house is 37feet in length x 20 feet in width and 17 feet in height. 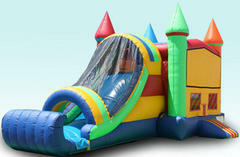 This bounce house rental is brightly colored and neutral for any event. You can also add a themed banner once the bounce house is in the cart. You can view our Water Version of this bounce house by clicking the link. Also be sure to check out our Concessions and add some flavor to your party. This Bounce house Rental comes with a bumper attached. you will need (2) outlets located within 75ft, each outlet must be on a seperate breaker switch. We do provide ext. cords but will not run over 75ft for fire safety.